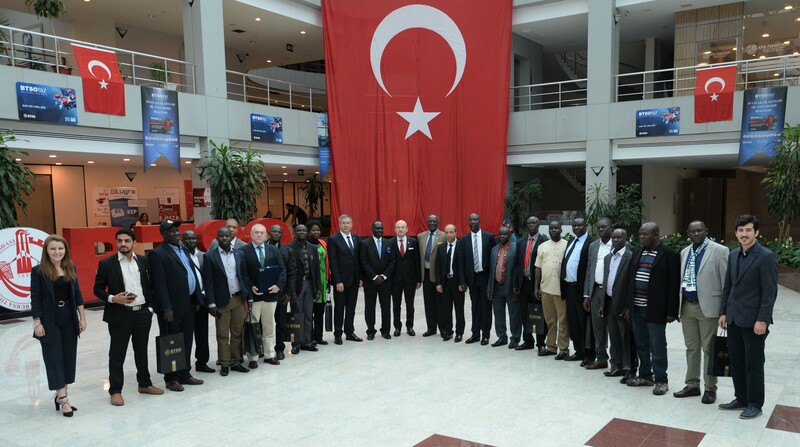 BTSO welcomed Mr. Debele Peter; District President of Arua Region and accompanying delegation from UGANDA with the participation of Mr. Muhsin Koçaslan, Mr. Haşim Kılıç; Members of the Board of Directors of BTSO and Mr. Metin Şenyurt; Vice President of the Assembly of BTSO. during the meeting both parties exchanged views on development of trade and cooperation between Bursa and Uganda. Mr. Koçaslan also emphasized that they wish to grow together with Uganda as Bursa business world and they qualify Uganda not as a competitive reach but as a potential market for business. Mr. Koçaslan continued by reminding well known African proverb; “Go alone if you want to go fast, go together if you want to go far” and added that they are ready to give their support and do all the necessary work for Uganda's economic development. Mr. Metin Şenyurt; Vice President of the Assembly of BTSO stated that members of BTSO has strengthen their competiveness in both in Turkey and in international arena through the arranged organizations. Mr. Şenyurt also informed the delegation about their realized fair and procurement delegation organizations in various sectors and expressed his wishes to see companies of Uganda as a participant in the future events.